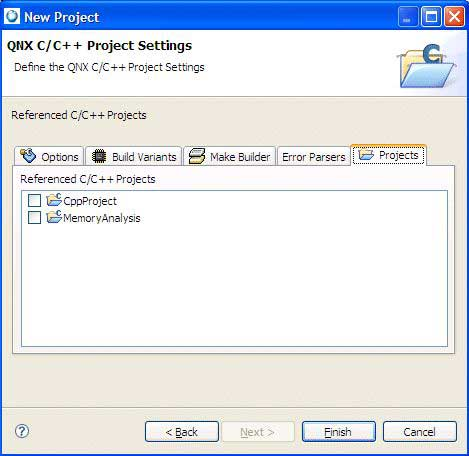 In the Projects tab for QNX C or C++ projects, the Referenced C/C++ Projects list lets you define project dependencies for the new project. In the list of other projects in Workbench, you can select one or more of them that the new project depends on. Initially, no projects are selected. For example, if you associate myProject with mySubProject, the IDE builds mySubProject first, then myProject. Note that if you change mySubProject, the IDE doesn't automatically rebuild myProject.